When someone is kind enough (thanks mom) to send you a huge piece of Kefalotyri cheese from home, along with some orzo and Greek thyme honey and numerous other foodstuff you've been craving for months, then the decent and obvious thing to do is, well, eat them right on the day they've arrived. And yes, reader, that's exactly what I did. When the box of goodies from Greece arrived at my doorstep last month, I couldn't wait to get upstairs and into my kitchen. I cooked up a mean giouvetsi (traditional Greek orzo dish) with chicken, which is not the typical meat you'd use for giouvetsi but I've made the conscious effort to eat red meat as infrequently as possible, and let's not forget, Greek Easter Sunday is only two weeks away when copious amounts of lamb will be consumed by yours truly, plus I'm pretending to be fasting and in my mind, chicken is Lent appropriate. The honey has been used in various desserts and morning rituals of bread slathered with butter and said honey, and the Kefalotyri has been enjoyed grated on top of aforementioned giouvetsi, nibbled with some freshly baked sourdough bread and good white wine and of course, used in one of my favorite mezes, the saganaki. I've talked to you about saganaki before (what it is, what the name means, etc) when I made one with soutzouki, tomato and eggs, but I've held off sharing with you my true saganaki love; the cheese saganaki. So here it is. You take a big slab of Kefalotyri cheese, you dredge it in flour and then you drop it into the sizzling olive oil. You watch it as it turns from pale, creamy white and smooth-textured, to yellow, golden brown and crispy all around. You carefully take it out of the saganaki pan, you squeeze some lemon juice over the top and you dig in. Salty, fried, zingy goodness straight into the mouth. Along with a glass of white wine or ouzo and some good company, it's really all you need to be happy. Okay, maybe some extra mezes wouldn't hurt. 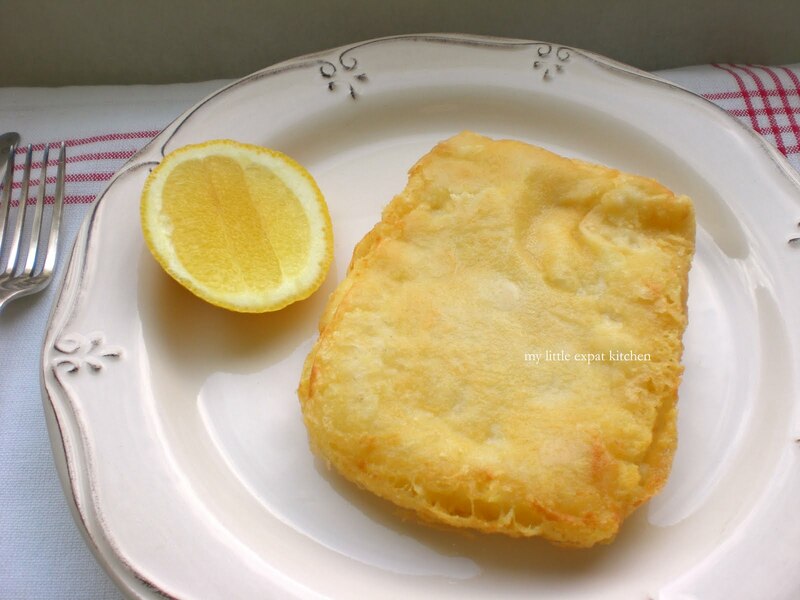 The cheese that's suitable for saganaki is a hard cheese because it needs to keep its shape during frying and not melt. Here, I used a Kefalotyri from Kastoria, a beautiful city in northern Greece, which is not too salty and is very firm. 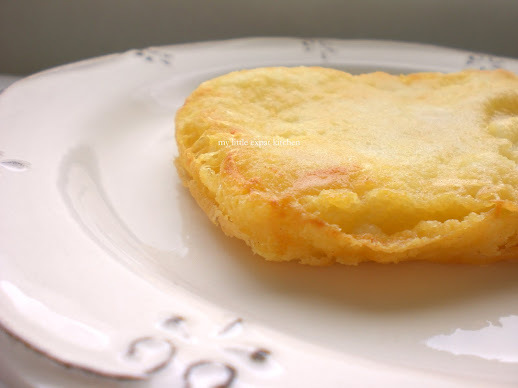 When the cheese is fried, its salty flavor is intensified so avoid using overly salty cheese. A good substitute for Kefalotyri is Pecorino Romano or Pecorino Sardo. 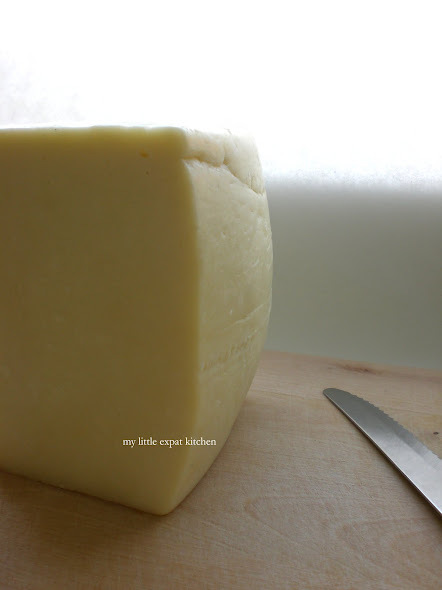 Cheese saganaki can also be made with numerous other Greek cheeses like Graviera or Kefalograviera (similar to Gruyère), Kaseri (similar to Kashkaval or Caciocavallo), Metsovone (similar to Provolone), hard Feta, or Halloumi. This Kefalotyri saganaki will definitely be making an appearance at my Easter Sunday table as it pairs excellently with lamb. Take the Kefalotyri cheese piece and place it under running water for a couple of seconds, enough to moisten it. Place the flour on a plate and dredge the Kefalotyri in the flour on all sides, making sure you coat it well. Gently tap the excess flour off. Pour the oil in your saganaki or small frying pan and heat over medium-high heat. When the oil starts to shimmer and it has gotten really hot, add the Kefalotyri. Fry the cheese for about 2 minutes on one side, then turn it on the other side and fry it for another 2 minutes, or until it has taken on a golden-brown color. Turn the heat off and take the cheese out of the pan using a spatula. Place the cheese saganaki on a plate covered with paper towels in order to absorb the excess oil and then onto a serving plate. 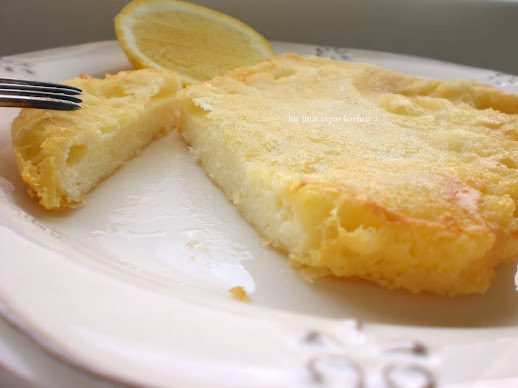 Serve with a lemon wedge. Squeeze the juice over the top and enjoy! 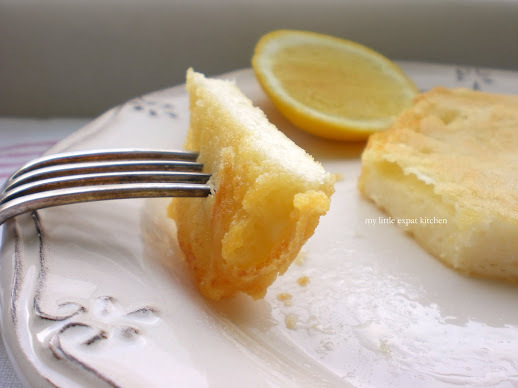 If you want to serve the fried cheese in the saganaki pan, then pour out the oil and serve. You are making this reader so crazy hungry for cheese right now, you have no idea! I gave up all bleeding animal products for lent...so...you know. Anyway, I love the good use you made of your Greek goodie bag! Sometimes my Aunt sends me goodies like thyme honey, nuts and chocolate... and it makes my week! I'm going to make saganaki for Greek Easter... thanks! Hmm, I've only just had my first cup of coffee today but already my stomach is rumbling at the sight of that cheese! You're amazing and I love this recipe. Isn't it great to get nice things in the post? I never give up anything for Lent but I'm still planning something extravagent and delicious for Easter. So simple, yet must be super delicious! I love cheese, especially if it is warm and melty... I bet I would love this saganaki! Banana Wonder — yeah, I know, I only fast the week before Easter. It's hard! The goodie bag was the best, I'm still nibbling on some kefalotyri as we speak! Emily Vanessa — it's great to get goodies in the post, especially when they're unexpected. What are you planning for Easter?? My mouth can't stop watering lol! Saganaki is my weekness! I love Saganaki! It's been way too long sonce we've had it - off to buy some Kefalotyri! Very nice care package from Mom! My best friend (she lives in Rochester, NY) is half Greek and she made me something similar once. Your photos brought me back to that day in her kitchen, snacking on hot cheese right out of the pan. Now that you've posted the recipe, I will have to try making it myself! Thank you. Also: my husband and I had a debate once whether chicken is Lent proper or not. He did a logic proof which proved that chicken is more similar to fish than to beef, therefore chicken is actually okay for Lent. 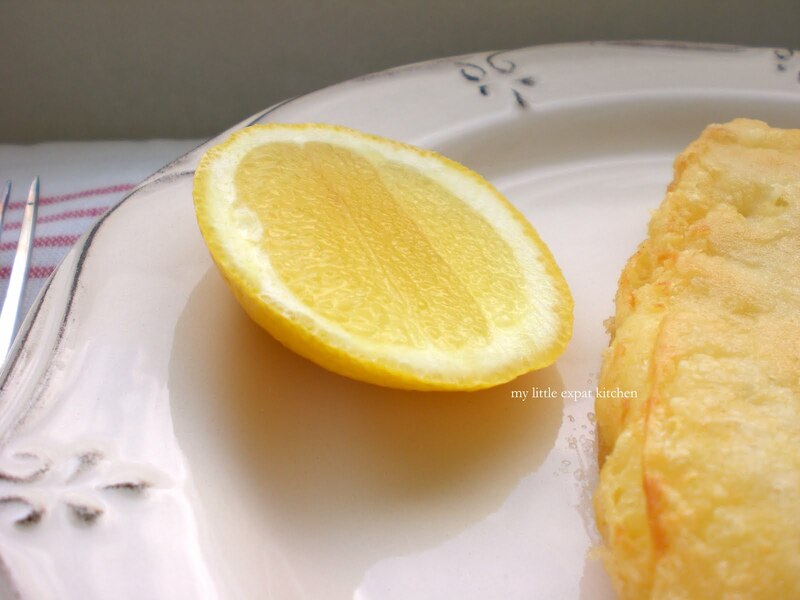 the golden color of your fried Kefalotyri is gorgeous. I've never had this cheese, nor that special thyme honey that you've told us about before---but someday! Magda this looks amazing, oh I love hot gooey cheese... and I made orzo for dinner today. we love orzo! 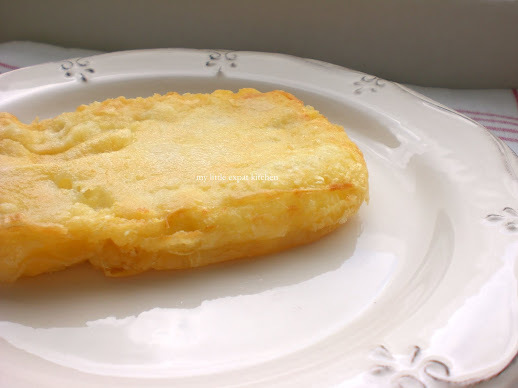 What a deliciously lovely fried cheese bite. This is a new cheese to me, but I will attempt to find it at a local cheese monger and try this recipe. Just the simple wonderful kind of thing I love to eat. Thanks. i love this meze, but i dont make it at home becos it is frighteningly fattening - we eat so much cheese and olive oil every day that it is almost bordering on decadence! Hi Maria. If I don't make it at home, I have nowhere to eat it here in Holland. At least I'm using the best quality ingredients at home. Magda, this is my first visit to your blog and your post filled me with excitement! I cannot wait for Easter so we can dig into delicacies like this! In fact, I have a block of Kefalotyri in the fridge waiting for next Sunday's feast. Thanks for your visual pre-taste! There was a great Greek restaurant where I used to spend my summers and we used to order an appetizer in pan of melted cheeze that you squeezed lemon on to and then dipped flat bread into. I think they called it saganaki. I wonder if it was just a different way of making that dish? That was definitely soft and melty. Whatever it was it was delicious. I loved the lemon on it... I have a little something for you on my blog. Yum Magda. Even I being in Greece am drooling and craving for saganaki. After a certain age we have to look after our health so we don't eat very often fried cheese. It looks sensational. What a great care package from home! As a fellow expat I can relate to the excitement of receiving goodies from back home. I love all Greek food and Saganaki is pretty high on the list. Thanks for sharing, it looks delicious! Dear Magda, we’ve just tried Saganaki. Well… I fried both Gruyere and Pecorino Romano for 4-5 minutes and the Gruyere piece overmelted and lost its square form. But Pecorino Romano was absolutely OK. I will take it into consideration. As for the taste, it was perfect in both cases! We imagined ourselves sitting in one of Hydra’s tavernas and enjoying our supper on fresh air… Oh, those were the days!.. Thank you for this simple but such a great recipe. Cheese Saganaki will be our favorite from now on! Hi Xenia. I'm so glad you enjoyed the saganaki. Gruyere is a melting cheese so it's kind of difficult to hold its shape perfectly that's why you need to coat it well with water and flour and fry it when the oil is very hot for 2 minutes rather than 4. I notice in your photos that the crust is a bit pale. 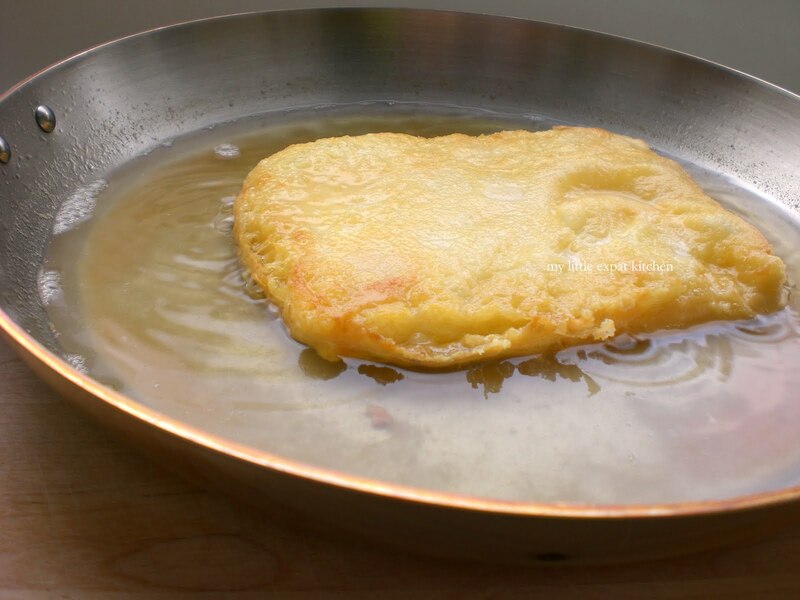 Try frying the cheese for longer and on higher heat next time to achieve a golden-brown crust. Thanks for sharing your photos Xenia! :) Oh I saw you sprinkled your saganaki with dried herbs (oregano (?)) What a great idea! Oh, thank you for the idea of frying for longer because both me and my boyfriend love crusty things! also the oil+brandy+lemon juice is the best part to dip your bread in it!!!!! I loved sagnaki in greece. Hoping to make it here with graviera, ouzo and bread on the side!